This delightful beachfront resort in beautiful Riviera Nayarit all-inclusive and room only plans to help you plan your perfect vacation. Room Amenities: Your 417 sq. ft. Deluxe Studio is designed to be your own private hideaway - a wonderful option for honeymooners or couples. Bedding includes either one king bed or two double beds. Other room features include an adjoining bathroom with Travertine marble-decor accents, kitchenette with coffee maker, electric stove top, microwave, refrigerator, toaster, special in-suite services, and either a terrace or balcony. Room Amenities: Your 892 sq. ft. One Bedroom Suite is so colorfully decorated and homey, you may never want to leave. The master adjoining spa bathroom is complete with an indoor jet spa tub and separate walk in shower. A second bathroom and walk in shower offers Travertine marble-decor accents. A spacious living area features a sleeper sofa while a well equipped kitchen, a washer/dryer complete the package. Not Included: Lobster and fine cuts, honor bar, deli take-outs, groceries and souvenir purchases at Palmita Market, take-out food or beverages from resort restaurants or bars, handicrafts, bingo, windsurfing, snorkeling, dry cleaning, tours and excursions. Room Amenities: Your 417 sq. ft. Junior Suite is designed to be your own private hideaway - a wonderful option for honeymooners or couples. Bedding includes either one king bed or two double beds. Other room features include an adjoining bathroom with Travertine marble-decor accents, kitchenette with coffee maker, electric stove top, microwave, refrigerator, toaster, special in-suite services, and either a terrace or balcony. Room Amenities: Enjoy one King, one Queen or Double bed in second bedroom and sofa bed in the living room. 900 square feet (83 square meters). Have up to two bathrooms with travertine marble decor as well as upscale amenities. Including a dining table and six chairs. The exterior balcony is furnished with patio furniture for up to six people. Room Amenities: Your 892 sq. ft. One Bedroom Suite is so colorfully decorated and comfortable, you may never want to leave. The master adjoining spa bathroom is complete with an indoor jet spa tub and separate walk in shower. A second bathroom and walk in shower offers Travertine marble-decor accents. A spacious living area features a sleeper sofa while a well equipped kitchen, a washer/dryer complete the package. 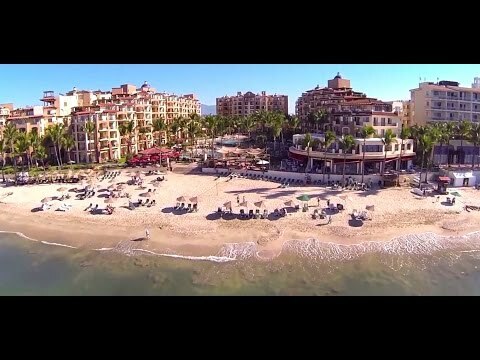 Villa del Palmar Flamingos is located in Riviera Nayarit, the charming beachside destination just north of Puerto Vallarta amidst world-class beaches and luxurious Mediterranean-style architecture. Everything you need for an exhilarating vacation: from a magnificent multi-level pool to exotic and mouth-watering cuisine to nearby championship gold courses and the European-style Tatewari spa. All 277 well-appointed air conditioned suites feature spacious private balconies or terraces that let you experience tropical living at its best, as well as a host of other top-notch amenities meant to ensure a stress-free vacation. It´s all about privacy and exclusivity and experiencing a personalized vacation. El Patron - Breakfast, Lunch and Dinner. Pizza Bar - Open for Lunch. Trattoria Restaurant - Open for Dinner. Palmita Deli and Market - Open for Breakfast, Lunch and Dinner. La Cevicheria - Open for Lunch and Dinner. Lobby Bar - Open Every Afteroon. Room Service - From 7:00 A.M. to 10:30 P.M.